Midtown East stretches from 5th Avenue to the East River and 40th Street to 59th Street. It includes neighborhoods such as Sutton Place, Turtle Bay and Tudor City. The population of Midtown East shrinks at night. It obviously has abundant services during the day, but some businesses close up shop once the commuters are gone. Still, it’s hugely convenient. Townhouses are found on Sutton Place, one of the most affluent streets in Manhattan as well as Beekman Place, which also has some of the city's most sumptuous apartment buildings, many of which have lush private gardens and unobstructed views of the East River. The majority of co-ops in Tudor City face inland parks and the Midtown skyline. Turtle Bay’s tree-lined streets and relatively quiet atmosphere, contains all sorts of buildings from tenements to luxury coops and condos, as well as elegant brownstones. Dine at the best such as The Four Seasons Restaurant, the city's greatest dining room; La Grenouille and Le Cirque, long time favorites; and Megu, Nobu, or Mr. Chow’s Midtown, Asian culinary royalty. You can also relax at Bierhaus, a well-welcomed Bavarian beer hall or join the celebrity scene at Monkey Bar or Tao. Midtown East is full of eateries of all types and price ranges. 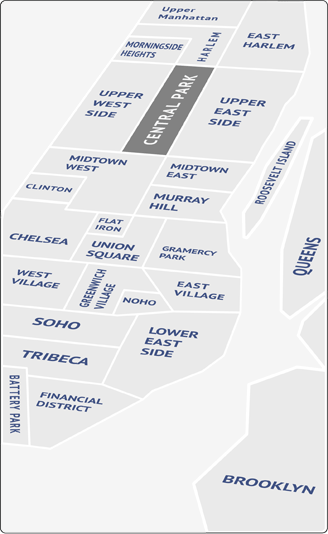 Midtown East is close to the Theatre District and the MOMA. One can take a tour of the United Nations, visit Morgan Library and Museum or revel in the architectural wonders or the Chrysler Building and Grand Central Station. Stroll along the East River or explore Bryant Park. Once these possibilities have been exhausted, head west to Central Park.